To assign a new drive letter to the new partition, select a letter from the drop-down box. The list contains all drive letters that are unassigned. If the letter that you want to assign is already taken, it will be not in the list. 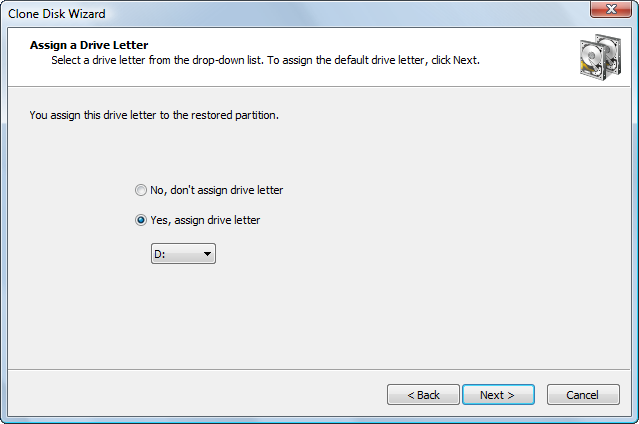 To allow the operating system to assign the drive letter, click No, don't assign drive letter. Windows XP will give the new partition the next available letter. Windows Server 2003 will see the partition but not assign any drive letter to it. To access the partition in Windows Server 2003, use Disk Manager to assign a drive letter. The drive letter you choose might be very important if the cloned partition contains installed programs. For example, if your source partition is partition E:, you should write the clone to a partition with the letter E:. Otherwise, all links stored in the registry that refer to those programs installed on E: will become invalid.